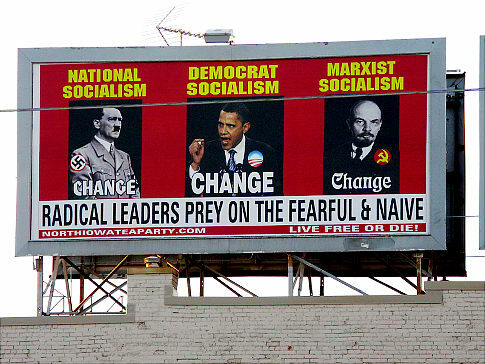 A billboard ordered and paid for by the North Iowa Tea Party shows President Barack Obama, Adolph Hitler, left and Vladimir Lenin, on South Federal Avenue in Mason City, Iowa, July 12, 2010. The comparisons between President Barack Obama and Nazi dictator Adolf Hitler, which were on display during last year’s health care reform debate, have resurfaced. This time, a Tea Party billboard in Iowa has compared our president with Hitler and former Soviet leader Vladimir Lenin. Here’s an open letter I wrote last year. Unfortunately, the call to stop such comparisons are still necessary.